In an age where we all take photographs, we rarely ever print them. There must be hundreds of photographs of Glyn the Dog on Graham’s phone, but the proudest and most prized image of Glyn is the one we have over our fireplace. A beautiful portrait is something that just can’t be replicated and we pride ourselves on taking stunning timeless images that will fit into any home. We specialise in fully finished ready-to-hang wall portraits. Your session takes place in the relaxed environment of our studio in Belfast. We then get you back a week later to see your pictures and choose which ones you would like transformed in to beautiful pieces of wall art for your family home. 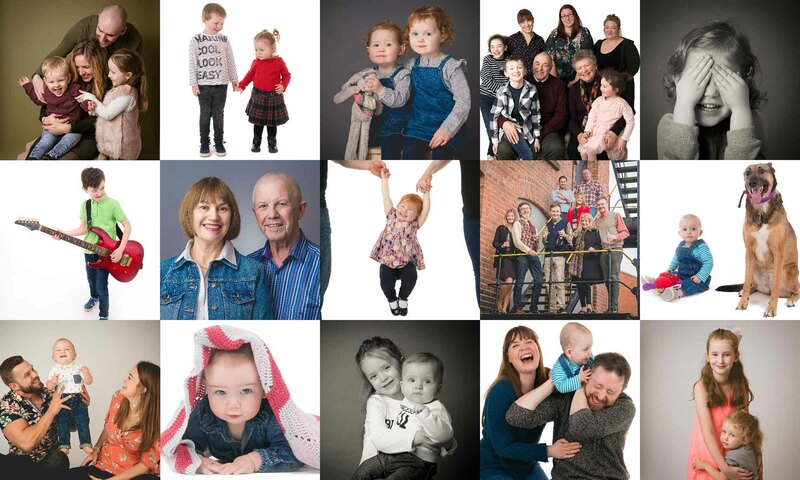 Family portrait sessions are suitable for 3+ people (we can accommodate up to 8 people in the studio). We charge a portrait sitting fee (of £25) to cover our time. The fee does not include any products (unless otherwise stated). We offer a range of different types of products (e.g. frames, prints, digital files) etc. each aimed at different budgets. Products start from just £60 for loose prints and £135 for framed pictures. Every customer is different and we aren't pushy sales people. We have a small, but cosy studio in an old linen mill. We can photograph up to 7 people or 3 pets at the studio. We photograph families, kids & pets. We only photograph babies once they are able to sit up. To book your portrait session with us you can call us at the studio on 02890 99 77 98 or use our online booking system at the bottom of this page. The most important aspect of any shoot is that you feel comfortable and relaxed. Happy people make happy portraits. We make getting your portrait taken a fun and easy-going experience. For family portraits, we suggest wearing clothes that make you feel good. You know the ones! Avoid wearing white or really pale clothes... because you will vanish if we use a white background! You might also want to wear matching socks... as you may need to take your shoes off to walk on our background. Clothes that may age, such as ones with logos, are best avoided. If you have a favourite hobby or sport and have some props... BRING THEM WITH YOU! You know the sort, musical instruments, footballs etc. They make for awesome pictures and also tell the world who you are! For pets, we suggest walking them and letting them do their business before the shoot. If they are like our Glyn and very excited, we would recommend tiring them out as much as you can beforehand! Bring their favourite toys and squeakers with you too! Try to avoid giving them treats during the shoot - as this will distract them. If your shoot involves a little one, we understand that some wee'uns become ill or just aren't in the best form. If this is the case, just give us a call and we can re-schedule. We don't mind as cancellations are included once free of charge. Once you shoot is over, we will decide a time that is convenient to you to get you back in again to see your pictures on our big projection screen. We call this an ordering session and you will have a chance to pick the pictures you would like to order. It usually happens a week or so after the shoot. It is really important that all those who make decisions in your family attend this session. If someone can't make it, we will have to reschedule it to a time that they can. As we have said, we aren't pushy people and will send you a full price list when you book (or before if you ask us). Payment for all products ordered is taken at the end of the session. We accept cash and all major types of credit/debit card. We also offer payment plans for purchases over £250. Do you do Gift Vouchers? Can you send me a price list?